Introduced fish species pose a significant threat to the conservation of native fish species in South Africa by preying on them, competing with them, or altering the environments in which they live. The continued spread of introduced fishes across South Africa is resulting in the homogenization of freshwater fish communities, threatening ecosystem functioning and the unique natural heritage of many of our rivers. Inter-basin water transfer schemes (IBWT), which transport water from one catchment to another via canals in order to meet increasing water demand from agriculture and industry, provide a major pathway for new fish invasions. 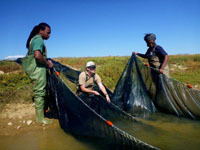 The South African Institute for Aquatic Biodiversity, with funding from the Water Research Commission and in collaboration with the DST-NRF Centre for Invasion Biology, is investigating how IBWTs and smaller-scale irrigation schemes facilitate the spread of introduced fish into new environments. Research began in 2011 to study the fish species in the Sundays River irrigation network, a complex network of canals and small off-channel dams that provide irrigation water to the citrus farms of the Sundays River valley east of Port Elizabeth. The majority of the water in this scheme is Orange River water that is transported via the Orange-Fish-Sundays IBWT scheme. Six species alien to the Sundays River and four native species have been introduced into the irrigation system. The project is investigating which of these species are able to colonize the dams and which cannot, and comparing the success of colonization to the number of fish entering the system as a result of the IBWT. Species under investigation include native fishes such as the Estuarine roundherring (Gilchristella aestuaria), alien species such as the North American mosquitofish (Gambusia affinis) and South African species not native to the Eastern Cape such as the African sharptooth catfish (Clarias gariepinus). Dr Cang Hui and Prof Dave Richardson from the DST-NRF Centre of Excellence for Invasion Biology (CIB) at Stellenbosch University are co-investigators.